Rene Tourigny has lived a full life in his seven decades. He traveled to exotic places—60 countries to be exact. He studied, taught, and volunteered all over the world. He is fluent in four languages and worked for the United Nations Development Programme in developing countries. He also played basketball, windsurfed, swam, played ice hockey, and he loved to dance. His life was filled with friends, fun, and spontaneity. Two years ago, an old ankle injury became troublesome and painful. He decided with his doctors that amputating his right leg below the knee would be the best course of action. 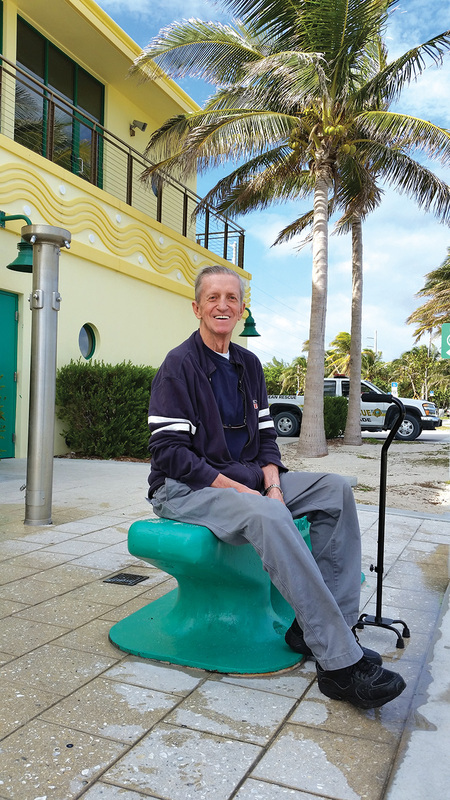 While he’s optimistic about his future, the 76-year-old is also a realist. A native of Trois-Rivieres, a small town halfway between Montreal and Quebec City, Quebec, Tourigny has settled in North Miami, Florida, where he lives in an eighth-floor condo facing Biscayne Bay and the Caribbean Sea. Tourigny says he enjoys the beach and has the proper prosthesis to go in water, yet he’s still apprehensive and is first working on summoning the courage to get into the swimming pool on his own. Despite challenges, he’s figuring out many things and making modifications along the way. One of the biggest adaptations he’s made was in his shower, replacing the shower head with a handheld “telephone” head, installing support bars in and out of the shower, and putting in a seat. Bathing is not so cumbersome now, he says. He’s also learned the benefits of using a quad cane to get around. Maintaining independence also means driving. Tourigny bought an SUV and installed hand controls. He took more than a dozen driving lessons to get used to using them. He still doesn’t drive at night and says the scariest time for him so far was merging into highway traffic during one of his lessons. But, he is confident that with time, he will be driving anywhere and anytime he wants to go. Like many seniors and new amputees adapting to prosthesis use, Tourigny says he has a fear of falling and stays focused on each step he takes. He’s also irritated by some of the daily adjustments he’s had to make. And there are still several real-life issues that concern him. 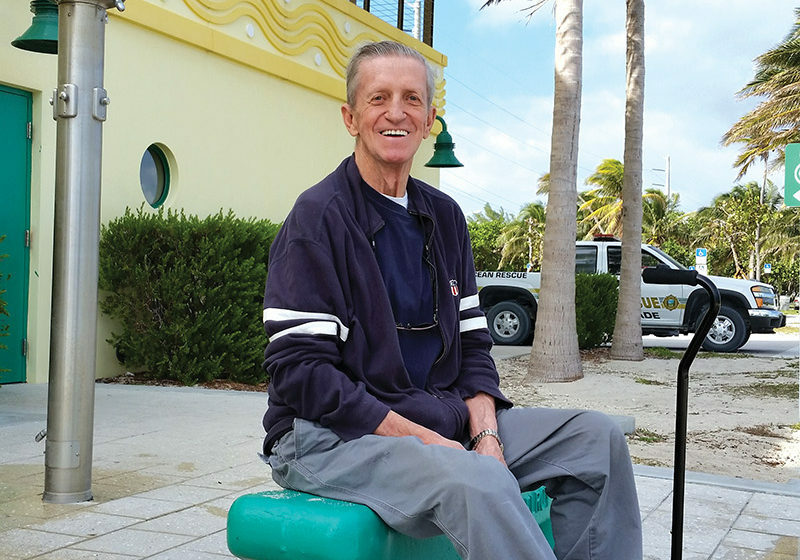 Even though he recently installed hurricane windows in his condo in South Florida, he worries about having to be evacuated and whether he will have a caregiver. Besides being a recent amputee, Tourigny also deals with diabetes, neuropathy, arthritis, and a low immune system. He’s also had trouble getting the proper prosthesis. After many months of adjustments, he’s hopeful that his latest suction socket will help him walk better and without pain. Figuring out the physical challenges may not be as difficult as getting through the emotional ones. Tourigny says he’s learned a lot about friendship and loneliness in the past two years. Though he keeps his brain active staying abreast of current events, especially international news, reading, and connecting with people on social media, he says he misses going to as many concerts, art exhibits, and other events as he used to. He misses the regular human contact, which was always a big part of his life. Tourigny knows that talking about his challenges can help him overcome them, and he’s seeking a support group and some supportive friends in the amputee community. Tourigny is confident that just as he has learned to navigate foreign lands, he’ll also learn to navigate this new environment. Editor’s note: Many recent amputees, especially older ones with multiple health problems, may, like Tourigny, struggle to get their lives back. While obstacles may linger, each step forward should be celebrated as a success. If you too are struggling to get your life back and are having difficulties, consider joining a local support group where you can meet other amputees who are ready to help. To locate a support group near you, visit www.livingwithamplitude.com/support-groups today. New friends and experiences may be just a visit away. Barrel Of Laughs - Amputee Humor: Funny Or Offensive?